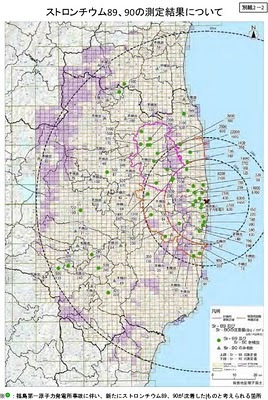 On September 30 the Ministry of Education and Science posted the blurry maps plotting the locations where plutonium and strontium have been detected. The Ministry’s 10-page document is in Japanese only for now. 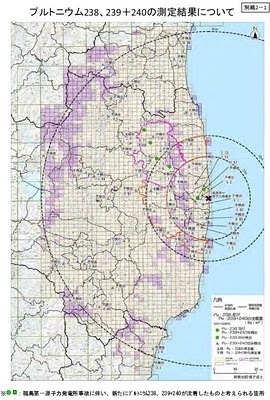 According to the Ministry, the survey for plutonium and strontium was carried out in early June to early July in 100 locations within the 80-kilometer radius from Fukushima I Nuclear Power Plant by government researchers. One location each in 59 municipalities within the 80-kilometer radius was picked, based on the air radiation level and the high population density. The remaining 41 locations were picked from within the 20-kilometer radius evacuation zones. The Ministry claims it is the first time plutonium has been detected outside the plant, but all that means is that it is the first time a government ministry has admitted to the existence of plutonium outside the plant. As the readers of this blog already knows, as early as April the researchers were taking soil samples outside the plant and have them tested for plutonium and found it (see here and here). The Ministry’s conclusion is that the amount of plutonium is not that big to cause any alarm, and that they should focus more on the decontamination of cesium-134 and -137. As for strontium, the Ministry does sound a bit more nervous. It says the ratios of radioactive strontium to cesium-137 in these locations were calculated; the ratios varied too much, indicating there was no correlation between the deposition of radioactive strontium and radioactive cesium. The Ministry will conduct further, more detailed study in locations that had higher strontium ratios. Thank you for staying on this story buried by MSM. I have turned off the TV in my home. Yesterday, while driving my car, I heard a CNN leading story. It was the Michael Jackson death story……what will it take for Americans to realize the USA has it’s own version of Pravda? It is insulting to anyone with an IQ over 80. Many of us here in Northern CA are suffering terrible breathing problems and illness….much worse than in years before. The radiation pouring out of Japan unabated is the real leading story. I find the complete denial of this disaster as obscene. Were it not for your site, we would all be totally in the dark. Thanks again for your bravery and truth, powerful money interests keep this story hidden.